Pixel Nero is one of those lovable stoves – goats. 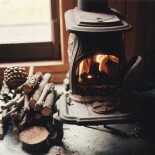 Until recently, this type stoves were associated more with cabinami or log cottages, than with a full-fledged stove to heat your home. It is erroneous thinking – Pixel Nero has a heat output row 6 kw (ie quietly warm medium-sized living room). This is what differentiates the stove from others is its unique design. A simple, ascetic block with ornaments – you can choose among several colors of natural stone or sheet of floristic ornamet – find something to your taste. An additional advantage of the simple design is that it fits perfectly ise of any style of interior. Pixel additional has also limited to mimimum carbon dioxide emissions into the atmosphere – according to the technical specifications ranks at altitudes of 0.08% which is a great result of stoves with similar power. This entry was posted on February 10, 2014 by jbellamy1 in Stove, Tips and Advices.